This, of course, made me pretty sceptical. After all, one of my favourite pet theories is Citizen Kane Syndrome, which states that influential classics lose their lustre because what made them shine is now cliché. I shouldn’t have been concerned though – the Spirit easily lives up to all the hype. 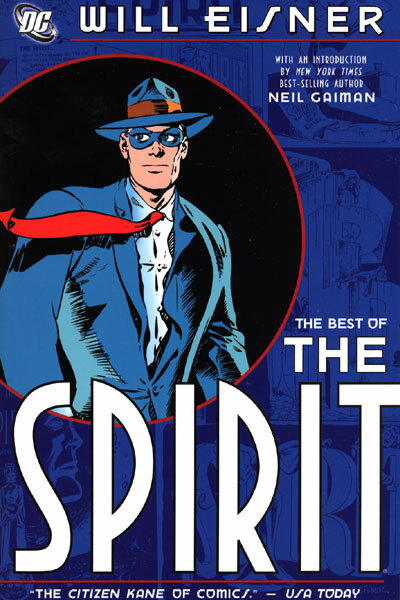 The Spirit was a widely syndicated adventure comic that appeared as an insert in Sunday newspapers across the United States starting with the aptly named "Origin of the Spirit" published on June 2, 1940. The Spirit was originally Denny Colt, a criminologist killed while on a case. Reincarnated as the apparently immortal Spirit, he sought justice around the world. The original run lasted 12 years, and changed the way comic book writers and artists worked. The introduction of "Meet P'Gell"from Oct. 6, 1946. 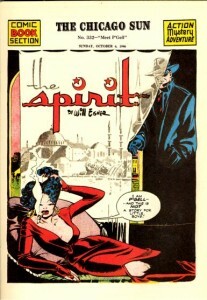 Eisner is often cited as an artistic genius who revolutionized pacing and layout. All of that skill is brought to life on the pages of the Best of the Spirit. His characters are cartoonish, but remain incredibly emotive. Characters that appear for only a panel or two are instantly sympathetic. And if you want to see just how groundbreaking his design is, please check out the picture on the right. I’ve often heard it said that Eisner was not afraid to spill ink all over the page and make his work incredibly dark. This is true, he’s not afraid of filling negative space with ink. However, it’s his colouring that was striking. It is incredibly bright and vibrant – bright yellows, oranges and greens pop in comparison to the black ink. Also, when the scene calls for it, Eisner will leave more than half a page blank with some lettering and one or two characters. His reputation for dark, moody work belied a surprisingly diverse and colourful style. What really impressed me though, was the quality of his writing. The stories are short – seven pages each – but cram in an entire tale that manages to include character development, action and resolution in one neat package. This is a far cry from today’s decompressed epics where it takes nearly 100 pages for anything of substance to happen. I would love to see a monthly Batman or Spider-Man book where there are two or three of these quick stories. They could be one-and-dones where the hero handles a case in the span of one night. I think it’d be a great contrast to the longer, more involved plotlines being used today. It would also make a great jumping on point for new fans. There are some small drawbacks to the Spirit, of course. The inadvertent racism of the Spirit strips can make the reader uncomfortable. Aside from a few brief glimpses, the highly offensive Ebony White wasn’t included in this collection. But there is still a brief appearance of an Italian landlady, Mrs. Pizza, who says things like “No sorr... She’sa keep d’apart-ement joosa like dis...” Yikes. Eisner had to create characters in shorthand to save space, and too often that means stereotypes. What’s most impressive about this book is how well it holds up. These stories were originally published between 1940 and 1950, but they’re still quick and fun. I’m definitely going to try and pick up more editions of the Spirit to add to my collection. The Best of the Spirit was a pleasant surprise that confounded my expectations and is definitely worth checking out if you're not familiar with Will Eisner's work.